Potential in sports is a dirty word. Players that have potential often don't have the production to match, and leave fans waiting and wanting a future that may never arrive. Stephen Strasburg is 25 years old and a very good major league pitcher. He is off to another good start this season with a 3.38 ERA, 2.44 FIP, 10.9 K/9, and 2.3 BB/9. Everything about those numbers tell you that Stephen Strasburg is already a very good starting pitcher and the Nationals are going to win a lot of games with him on the mound. 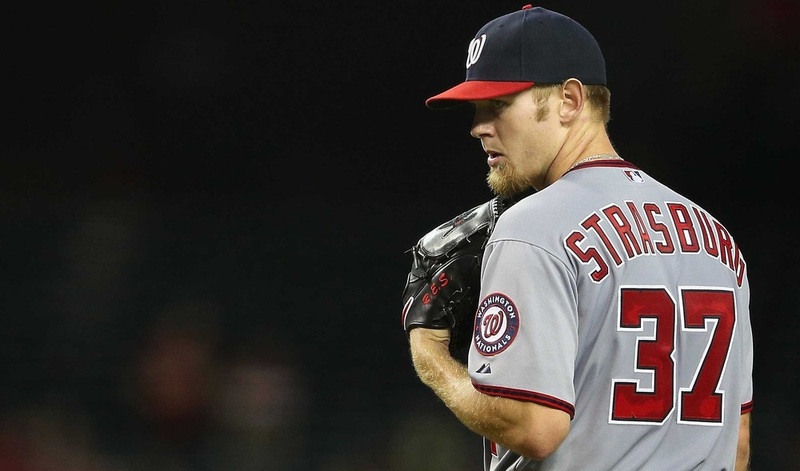 What those numbers don't tell you is that Stephen Strasburg could be even better. With three plus pitches and command of all three Stephen Strasburg has all the ability to win a Cy Young award and be mentioned alongside pitchers like Clayton Kershaw and Adam Wainwright as the best in the NL, but it hasn't yet happened for Strasburg. He is still learning how to pitch and it looks like his aging curve is going to be much more normal than that of someone like Tim Lincecum. Strasburg isn't setting the world on fire or taking baseball by storm the way it was expected when he debuted in 2010. He is a very good pitcher in a league that is full of very good pitchers, and the world is waiting for him to take that next step. The biggest thing Stephen Strasburg struggles with is being Stephen Strasburg. He wants to pitch like a finesse pitcher relying on his great curve and excellent change-up to throw hitters off balance early in the count before mixing in the fastball. That style of pitching is good and well if you're Livan Hernandez or Bronson Arroyo, but when you're a power pitcher don't be afraid to go after hitters. Challenge them with heat up in the zone and make them beat you, and when they fall behind then mix in the secondary pitches to strike them out. Stephen Strasburg is like the lion that wishes to be an antelope. If pitch sequencing is the primary thing Strasburg is still struggling with then the secondary is losing concentration. On more than a few occasions an error has been made behind Strasburg and the next pitch is a meatball right over the heart of the plate. The runs go down as unearned on his record, but still count against the Nats. Strasburg needs to concentrate just as hard on the hitters that come up after an error as he does the hitters that come up after he surrenders a walk or a hit. All base runners are equal once they reach base and how they got there is of no importance. Stephen Strasburg also has some concentration issues when it comes to not hitting batters. He hit 12 batters last season and has hit three so far in 2014 with two of them coming in last night's loss to the Reds and being the only two runs the Reds scored in regulation. Strasburg has a low BB/9 but hitting batters is giving them as much a free pass as walking them in and letting extra runners reach base is never a good thing. Strasburg's two-seamer is the pitch most responsible for the hit batters and it is a pitch that Strasburg doesn't even need. It is nowhere near as good as his three main pitches and causes more trouble than it is worth with the hit batsmen. At 25 years old in the major league Stephen Strasburg is still learning who he is. He has been a very good pitcher so far in his career, but hasn't yet taken the next step to greatness. He isn't a pitcher that can be counted on to go out and give seven shutout innings on most nights in the way Clayton Kershaw and Adam Wainwright can. Strasburg's career is a long way from over and all of his remaining issues are things that can be learned. Strasburg's biggest weakness coming into 2014 was controlling the running game, and he has handled that better than expected. When Strasburg gets the nuances of the game down he is going to be a Cy Young contender. He just isn't yet, and watching a pitcher with that much potential not live up to it can cause frustrations. Stephen Strasburg still has things to learn about the game of baseball, and he's being taught every outing. With ten starts made in 2014 he has more than two thirds of his starts remaining and could easily go on a stretch of pure dominance. That pitcher exists within Stephen Strasburg and is being molded as we speak. Stephen Strasburg is a very good starting pitcher that happens to be on the edge of greatness.